LaFayette is a town in Onondaga County approximately 11 miles south of the City of Syracuse, New York. LaFayette is mainly an agricultural community with rolling hills, scenic views and has long been recognized as one of the primary apple producing regions of Upstate New York. The Town of LaFayette has a population of approximately 4900 residents and is easily accessible by highway via Interstate 81, US Route 11 (both north/south) and US Route 20 (east/west). Schools: LaFayette residents are in the LaFayette Central School District which is comprised of one elementary school (Grimshaw - kindergarten through 6th grade), one junior/senior high school (LaFayette - 7th through 12th grade), Onondaga Nation School (kindergarten through 8th grade) and The Big Picture School (9th through 12th grade). The Onondaga Nation School consists solely of native American children and includes the Onondaga language and culture into their educational framework. The Big Picture school is currently housed at the LaFayette junior/senior high school to address the needs of "at risk" students who don't fit in the conventional school system. Their mission is to provide personalized education where each student spends considerable time doing work in the community supervised by mentors. Shopping & Dining: There are local shops which provide the basic necessities for rural living. Larger stores, restaurants and supermarkets are within a 15 minute drive to Syracuse, NY. Local restaurants include the Log Cabin Family Restaurant, Old Tymes Cafe, Thor Restaurant and Orchard Vali Golf Course's Golden Apple Dining Room. Parks/Lakes/Recreation: Hunting, fishing, hiking, cycling, four-wheeling and snowmobiling are favorite activities. The LaFayette Apple Festival featuring the regions apple crop is also one of the northeast's premier arts and crafts show with over 500 crafters and artisans from numerous states. The high quality of the exhibitors, uniqueness of products offered, and diversity make the Apple Fest a hit for everyone! 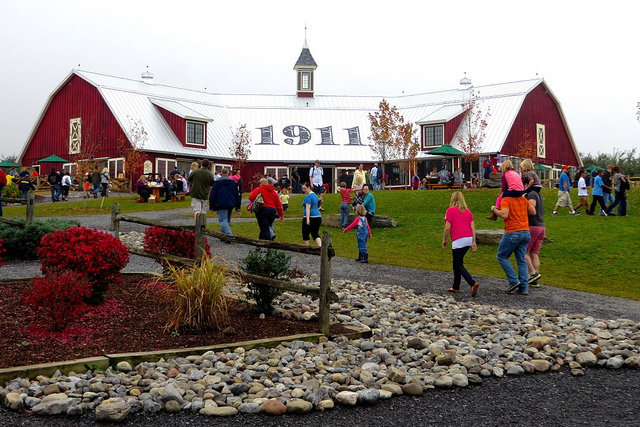 This small community has grown accustomed to having 90,000 visitors attend from all parts of New York and even New England every Columbus Day weekend. The Orchard Vali Golf course is in LaFayette with 4 other courses within a 7 mile radius from the center of town. How is the market in LaFayette New York? It is a buyers market in LaFayette. The average sales price is $150,000 and the average time it takes to sell a home, when priced correctly, is 108 days.